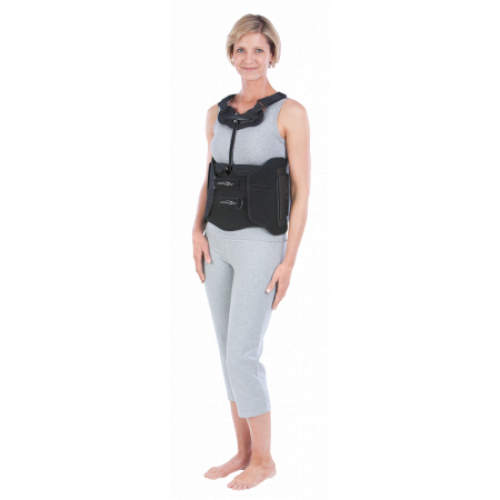 The DonJoy Back Brace II TLSO accommodates the appropriate motion restriction throughout the healing process. The lightweight design includes a patented Mechanical Advantage Pulley System, a quick-release shoulder strap buckle, and an easy to use thoracic adjustment. All these features allow for the patient to control and relieve acute pain often associated with anomalies of the spine such as osteoporosis, compression fractures, spinal stenosis, strain, and excessive kyphosis. Ideal for Low Back Pain, Low Back Sprains/Strains, Lumbar Disc Displacement, Osteoporosis, Disc Herniation and Degneration, Post-Operative Laminectomy, Post-Operative Disectomy, IDET Procedure, Spondylolisthesis, Post-Operative Fusion, Spinal Stenosis, Compression Fractures, and Scoliosis. Intended for acute pain relief by thoracic postural extension alignment, compression fractures of the thoracic spine, early onset through variable stages of osteoporosis, pre and post-surgical protocols, thoracic mechanical back pain and kyphosis. Rigid anterior and posterior panels restrict forward flexion and trunk rotation. Panels are easily removed and can be thermoformed for customized fit. Telescoping sternal Y-Bar can be adjusted to desired height or locked into position. Sternal Y-Bar can be bent and custom fitted to the desired angle. Quick release shoulder buckles allow for easy donning and doffing. Features the patented Mechanical Advantage Pulley System. 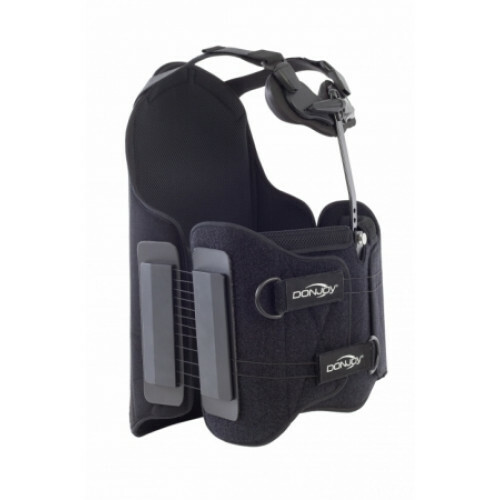 11-1585-2 DonJoy Back Brace II - TLSO S 30-35” 17"
11-1585-3 DonJoy Back Brace II - TLSO M 35-40” 17"
11-1585-4 DonJoy Back Brace II - TLSO L 40-45” 19"
11-1585-5 DonJoy Back Brace II - TLSO XL 45-50” 19"
11-1585-6 DonJoy Back Brace II - TLSO XXL 50-55” 19"